Are you struggling with email? Newsletter numbers getting you down? Fewer people opening your messages? No real reaction when you launch a book?There's another way-a better way.Imagine having a large list of happy readers who devoured every email you sent. Or launching a book and activating an army of fans who did the selling for you. 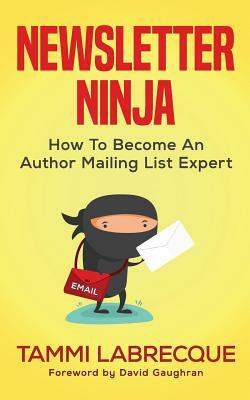 You could be that person, with the help of Newsletter Ninja.Newsletter Ninja is a comprehensive resource designed to teach you how to build and maintain a strongly engaged email list-one full of actual fans willing to pay for the books you write, rather than free-seekers who will forget your name and never open your emails. - Learn new ways to think about your email list- Re-energize your existing subscribers- Embrace not just the basics, but next level methods- Improve engagement and watch those open/click rates soar- Build a happy list of passionate readers- Launch your books into the chartsYou'll get a handle on open rates, click rates, and engagement-while also learning about yourself, your readers, and what you're really selling when you send an email. (Spoiler: it's not your books. )Whether you're building a mailing list, want to grow an existing one, or simply want to raise your email game, Newsletter Ninja has solutions that will work for you.